Before I go to the post, here is wishing all my readers who are celebrating Christmas today a very Merry Christmas. Hope you all are having a great time with family, friends and of course good food :) Moving on, baking with pumpkins has been on my to do list for the longest time. I have no idea why I resisted or waited so long to try anything with it. Anyway as they say, better late than never :) I finally got a chance to try this easy pumpkin muffins that were so soft and delicious that I just loved them. 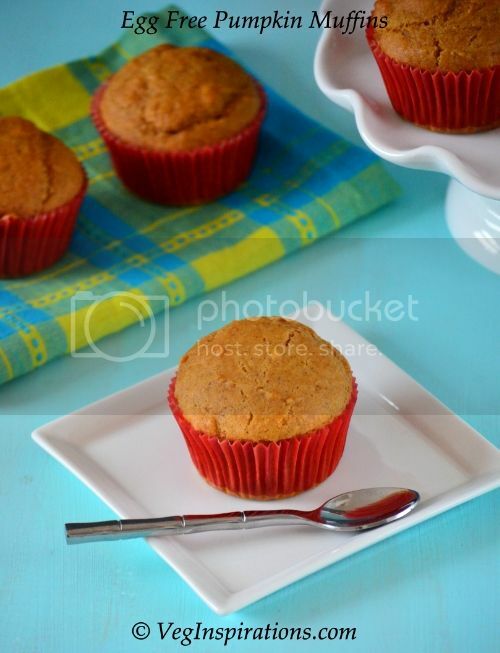 The combination of cinnamon and nutmeg adds a wonderful fragrance and flavor to these muffins. 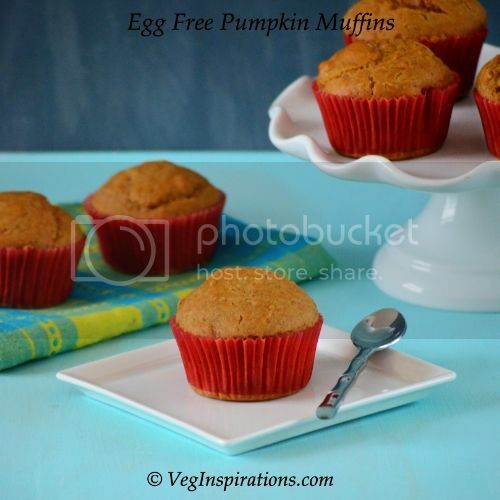 And the best part, these muffins do not have any eggs or butter so they are a guilt free treat too :) I used this recipe as a reference for this muffin and I am so, so glad I tried these. Now I have many more pumpkin recipes swirling around my head, let me see how many recipes I actually end up making:) Give this one a try and as always, let me know what you think about it. Pre heat oven @ 350 deg F (approx 180 deg C) Pre line a muffin tray with liners and keep aside. In a large bowl, add flours, baking powder, soda, salt, spices and sugar and mix well. Add pumpkin puree and milk one at a time and slowly mix into the flour mixture. Add oil and mix well. Spoon mixture into pre lined muffin cups until it is 2/3 full. Place in pre heated oven and bake for 17 to 22 mins or until toothpick inserted in the center comes out clean.